I thank you, Mr President, for your words of welcome and your kind invitation to visit this nation. In addressing you, I would like to greet and thank all the people of Panama who, from Darién to Chiriquí and Bocas del Toro, have made a marvellous effort to welcome the many young people arriving from all over the world. Thank you for having opened to us the doors of your home. I begin my pilgrimage in this historical precinct where Simón Bolívar, who stated that “if the world had to choose its capital, the Isthmus of Panama would be marked out for this great destiny”, convoked the leaders of his time to forge the dream of the unification of the Great Fatherland. A convocation that helps us realize that our peoples are able to create, to forge and, above all, to dream of a great fatherland that can include, respect and embrace the multicultural richness of each people and culture. Taking up this inspiration, we can look upon Panama as a land of convocation and of dreams. This was seen in the Congress of Panama and is seen today too in the arrival of thousands of young people who bring with them the hope and desire to meet and celebrate with one another. Thanks to its privileged location, your country is a strategic enclave not only for the region but also for the entire world. A bridge between oceans and a natural land of encounter , Panama, the narrowest country of the entire American continent, is the symbol of the sustainability born of the ability to create bonds and alliances. This capacity shapes the heart of the Panamanian people. Each of you has a special place in the building of the nation, and is called to ensure that this land can live up to its vocation to be a land of convocation and encounter. This involves decision , commitment and daily effort to ensure that all have the opportunity to feel that they are agents of their own destiny and that of their families and the entire nation. It is impossible to think of the future of a society without the active – and not merely nominal – participation of each of its members, in such a way that his or her dignity is acknowledged and guaranteed through access to quality education and the promotion of dignified jobs. These two realities help make it possible to recognize and appreciate the genius and the creative dynamism of this people . Similarly, they are the best antidote to any type of “guardianship” that would restrict your freedom and subordinate or ignore the dignity of citizens, especially that of the most poor . The genius of these lands is marked by the richness of its indigenous peoples: the bribri , bugle, emberá, kuna, nasoteribe , ngäbe and waunana , who have so much to relate and recall from their culture and vision of the world. I greet them and I thank them. To be a land of convocation means celebrating, acknowledging and listening to what is specific about each of these peoples and of all those men and women who make up the face of Panama and work to build a future of hope. For it is possible to defend the common good above the interests of a few or for few only when there is a firm decision to share with justice one’s goods. The younger generation, with its joy and enthusiasm, with its freedom, sensitivity and critical capacity, demands that adults, and especially all those who exercise roles of leadership in public life, lead a life consonant with the dignity and authority that they possess and that has been entrusted to them. They call upon them to live in simplicity and transparency, with a clear sense of responsibility for others and for our world. To lead a life that demonstrates that public service is a synonym of honesty and justice, and opposed to all forms of corruption. Young people demand a commitment in which all – beginning with those of us who call ourselves Christians – have the audacity to build “an authentically human politics” (Gaudium et Spes, 73) that makes the person the centre and heart of everything. A politics that works to build a culture of greater transparency between governments, the private sector and the entire population, in the words of your prayer for your country: “Give us our daily bread: may we eat it in our own homes and in a state of health worthy of human beings”. 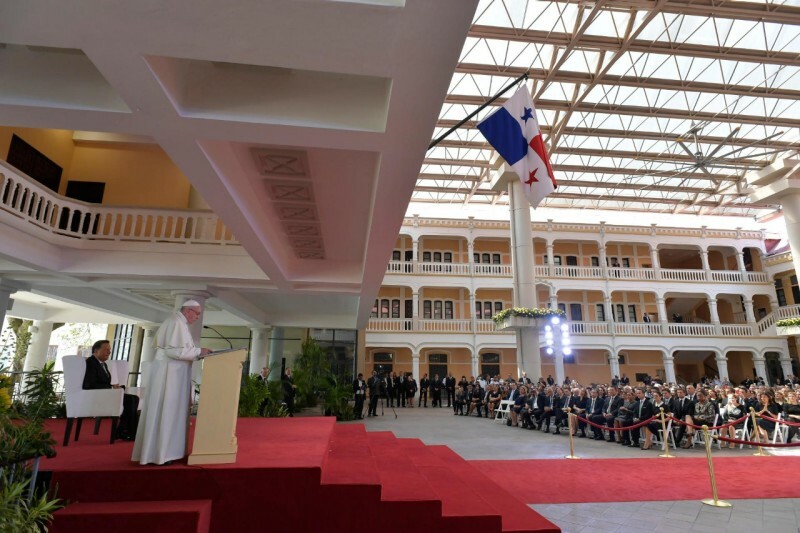 In these days, Panama will not only be spoken of as a regional centre or strategic site for commerce or the transit of persons: it will turn into a hub of hope. A meeting-point where young people coming from the five continents, brimming with dreams and hopes, will celebrate, meet one another, pray and kindle their desire and commitment to building a more humane world. In this way, they will defy the shortsighted and short-term views that, seduced by resignation or greed, or prey to the technocratic paradigm, believe that the only way forward is to obey the “laws of competition, [speculation] and the survival of the fittest, where the powerful feed upon the powerless” (Evangelii Gaudium, 53). To believe that would be to close the future to a new imagination of humanity. By welcoming the dreams of these young people, Panama becomes once more a land of dreams that challenges so many certainties of our time and opens up vital horizons that can enrich the path ahead through a respectful and compassionate gaze upon others. In these days, we will witness the opening of new channels of communication and understanding, of solidarity, creativity and mutual assistance; channels of humanity that foster commitment and break through anonymity and isolation, for the sake of a new way of building history. Another world is possible! We know this and young people urge us to take our part in building it, so that our dreams do not remain ephemeral or ethereal, but can promote a social contract in which everyone has the chance to dream of a tomorrow. The right to the future is also a human right. Against this horizon, the words of Ricardo Miró seem to come alive. In singing to his beloved homeland, he said: “When they see you, my native land, they might say that you were shaped by God’s will, so that beneath the sun shining down upon you, all humanity can come together in you” (Patria de mis amores ). Once more I thank you for everything you have done to make this meeting possible, and I express to you, Mr President, to all those here present, and all those who join us through the communications media, my best wishes for renewed hope and joy in the service of the common good.